This time of year, MSPs and business owners like you are focusing their attention on new goals that will lead to growth and scalability. Strategies and targets must be reiterated to the team at large and carried out throughout the length of the year. But how do you keep your team members aligned and motivated without constantly micromanaging or over communicating? Giving all employees visibility into company goals and hard data sends a message that they are a trusted and integral part of the team. It gives them a sense of ownership and accountability over their work and the part they inevitably will play in helping your organization reach success. Naturally, employee turnover is bound to happen. But employers are keen on keeping their talent on board, especially in an industry like the service industry where knowing a customer’s history makes a big difference in that customer’s loyalty. So, what makes employees stick around? It goes beyond the person liking what they do on a technical level. There’s a great deal of power in feeling valued, indispensable, and in the loop. Many of us have worked for companies where there was a very bureaucratic process and high-level conversations were solely kept behind closed doors. The lack of transparency that comes with that makes employees kind of feel like what they do doesn’t matter since important company information is reserved for just a select few. But when the opposite happens, and every employee is given access to company numbers, revenue, profits, goals, plans for growth and structure, etc., everyone feels like they are actually a part of the story. Team members will be committed and dedicated to getting their job done and hitting company goals because they’ve been shown that they are trusted to do so. Visibility isn’t some thin veil that gives employees a false sense of security. It’s real and it drives employees to feel like their role goes beyond just earning them a paycheck. Employee motivation and retention strategies will vary across companies and will depend on a number of factors like size and structure. That being said, we have a few recommendations that we believe can be applied within any organization to help improve the visibility you’re giving to team members. If you’re a team lead or manager, a portion of your responsibility is to ensure your team is collectively working towards the overall goals of the organization. But, like we said before, who wants to spend all their time micromanaging? Meaningful assignments directly tied to goals inherently reminds employees of the task at hand and motivates them to work for it. Busy, shallow work does little to encourage employees. It’s tedious and unchallenging. But meaningful, purposeful projects serve as a reminder that your team members have a real stake in the company and their productivity will have tangible results. The opportunity to constantly learn and grow - through challenging work - encourages people to be more efficient and autonomous and to just keep improving. Few things are as impactful as an executive who makes their presence known on a personal level. We’re talking about CEOs and founders who know the names and roles of everyone working for them, who make it a point to touch base with their employees on a regular basis, who make themselves available to address roadblocks and successes alike, and who simply keep themselves visible. When everyone from the Office Manager to the Director of Sales feels like they are known and seen by the “The Boss”, it’s beyond motivating. Suddenly team members want to do everything in their power to be a valuable team player, so they’re going to go above and beyond to perform well without having to be reminded or asked to do so. We've heard of CEOs who don't have an office and instead choose to use a desk in the middle of the floor, just like everyone else. No office politics there. Data speaks volumes. You can’t argue with hard facts. And you can’t hide behind numbers. Giving every employee access to company data is a huge deal. Show you trust your workforce and they’ll repay the favor big time. However, data is complicated, so how can it best be shared? Through business intelligence dashboards. By using something like BrightGauge, you can display all of your important company KPIs on a single pane of glass and share it with everyone in the company. For example, let’s say your company is really big on sales numbers. Number of new customers, monthly recurring revenue, opportunities in the pipeline, and qualified leads are metrics everyone’s going to care about. If you have TVs around the office that display these metrics on an easy-to-analyze dashboard, then your visibility game is incredibly strong. 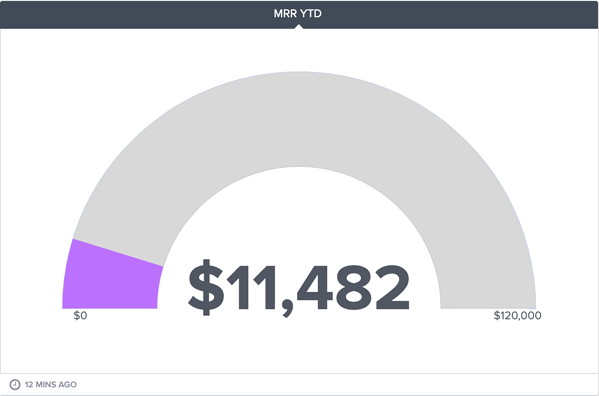 Something as simple as a gauge that shows how much you’ve met of your MRR goal can be a daily, visual reminder of why team members are doing what they’re doing. They’re all working together to hit a goal and that gauge acts as the nonverbal nudge (peace out, micromanaging). Unless there’s a serious productivity problem, there’s really no need to stand over someone’s shoulder and make sure they know why they have to do the work they’re doing. Practicing transparency and visibility is a much more powerful way to motivate employees and drive productivity. Plus, an environment that encourages autonomy and trust breeds employee retention and satisfaction, which bodes well for all parties involved. For more on the importance of transparency (both with clients and employees), check out our webinar, ‘Building Transparency Into Your Business’.